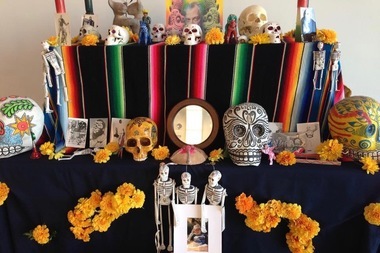 The Día de los Muertos altar created by Mexican artist Oskar Romero at the Ed Paschke Art Center. JEFFERSON PARK — An event at the Ed Paschke Art Center will mourn internationally acclaimed Chicago artist Ed Paschke, who died 11 years ago. The ceremony, set for 5 p.m. Wednesday, will also mark the closure of the Jefferson Park art center's installation honoring the Day of the Dead, which honors those who have died. Traditional Nahualli Aztec dancers are set to perform around the art center's Dìa de los Muertos altar created by Mexican artist Oskar Romero, organizers said. Attendees will get a chance to burn copal incense, strew marigold petals, eat Mexican pastries and listen to live drumming during what organizers said is designed as an intimate event to commemorate Ed Paschke's death on Nov. 25, 2004, as well as that of his wife, Nancy, on Jan. 17, 2005. Paschke, who often was called Chicago's most important visual artist, also taught for 27 years at Northwestern University, where he served as the chairman of the department of art theory and practice. Paschke's work has been featured in a retrospective at the Art Institute and at the Pompidou Center in Paris. The Ed Paschke Art Center, 5415 W. Higgins Ave., opened on what would have been the artist's 75th birthday in 2014.